Golden Eagle. Bird Watching Golden Eagles. Description - Golden Eagles are large, brown eagles that have a pale golden wash on the back of the head and neck; the tail is faintly banded. In young birds, the tail is white at the base and black at the tip. Although usually silent, the call of the golden eagle is a high-pitched "kee-kee-kee" or a high scream or squeal. Distribution - The breeding range of this bird is from Alaska east across northern Canada, including British Columbia, and south to Mexico; they winter in the southern part of the breeding range. Golden eagles occur in mountain forests and open grasslands and in any habitat during migration. 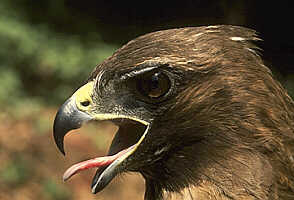 Biology - The golden eagle preys on jackrabbits, large rodents, snakes and carrion. 1-4 unmarked or lightly speckled whitish eggs are lain in a large mass of sticks placed on a rocky ledge or in a tall tree.